Spain’s Finished Slate exports have had multiple fluctuations during last years. However, 2017 statistic reports show that the country remains the greatest finished slate exporter in the world. 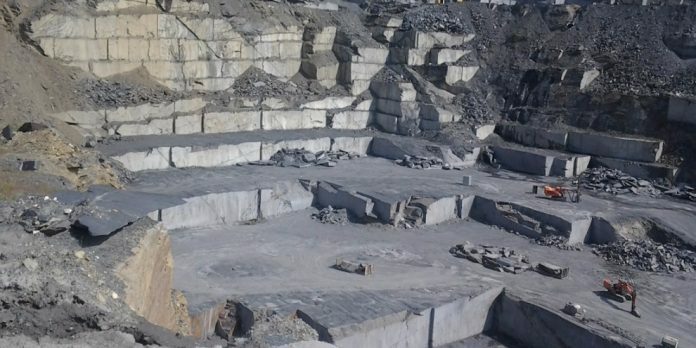 Stonenews.eu, after studying the statistical results of the International Trade Centre and the National Statistical Institutes, is presenting the growth of Spain’s Finished Slate exports between 2015 and 2017 and the shares in value and quantity of exports in 2017. From 2001 to 2007, Spain’s Finished Slate exports have been increasing in extremely high rate. However, since 2008 it has shown a downward trend just to end up at 2001 rates. More specifically, between 2001 and 2007, the exports value increased by +63.13% while between 2007 and 2017 there was a decline by -36.6%. In 2017, compared to 2016, the exports value rose by +1.36% while the quantity slightly decreased by -0.61%. In 2017, Spain increased the price per tonne by 2% after two years with decline in a row. The main reason for this boost was the rise of exports to France, which is the top destination of Spain’s finished slate exports. 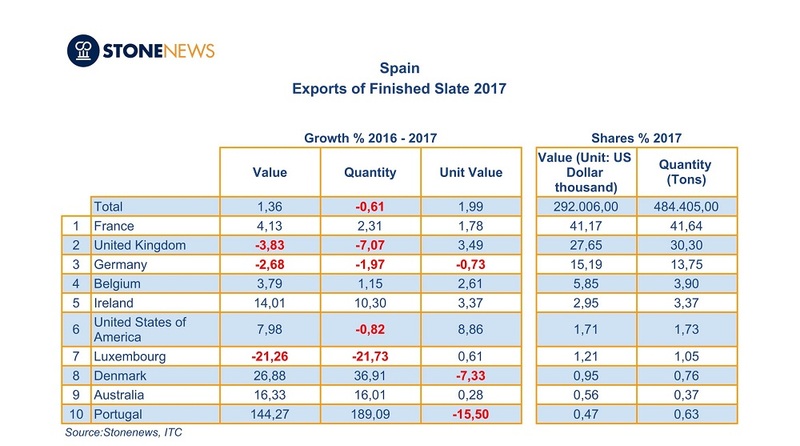 The table below shows the top 10 destinations of Spain’s Finished Slate exports based on the shares in 2017 export value. As seen at the table, in 2017, Spain exported finished slate products with higher price per tonne -compared to 2016- to the U.S. by +8.86%, to the U.K. by +3.49%, to Ireland by +3.37%, to Belgium by +2.61%, to France by +1.8% and to Luxembourg by +0.61%. On the contrary, it exported with lower price per tonne to Portugal by -15.5%, to Denmark by -7.33% and to Germany by -0.73%. Finally, it is worth noting that in 2017, Spain exported Finished Slate to 68 countries.